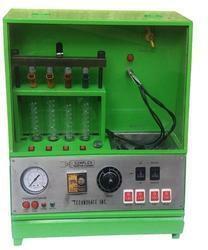 Offering you a complete choice of products which include simplex injector cleaning machine. Robust manually operated equipment with pressure gauge, timer, ultrasonic bath cleaner. 1Ltr. Capacity stainless steel tank for Ultrasonic bath for heavily soiled injector. Additional Battery charging facility for 1 car battery. High quality Stainless Steel rail. High quality graduated glass Borosil for clear reading. Pressure controller to control pressure. Can check Flow, Leak Volume test. Looking for Vacuum Cleaners. ?